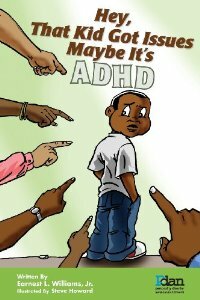 Hey, That Kid Got Issues Maybe It’s ADHD by Earnest L. Williams, Jr.
Hey, That Kid Got Issues Maybe It’s ADHD is a very educational book about the mental health condition Attention Deficit Hyperactive Disorder. ADHD is a condition that effects 1 in 10 school age children between the ages of 5 and 17. The story is about a little boy named Justin. Justin is a lively, spirited, and outgoing child. His high spirited personality seems to get him into trouble at school. It is hard for him to pay attention and listen to his teacher, and it’s even hard for him to sit still, even when he is being told to calm down. Justin’s father comes to his school to collect Justin and he decides to take Justin to a doctor to see what they can do to help his son. The doctor diagnoses Justin with ADHD and she gives Justin’s dad some helpful pointers. The doctor helps Justin’s dad understand what ADHD is and how to lovingly help Justin with his ADHD. Justin’s dad learns that Justin will be okay. Even Justin remains hopeful that he will be okay living with ADHD, and will one day be “on green”. The Foreward is written by the CEO of the publisher of this book, Personality Disorder Awareness Network’s (PDAN), Frederic Bein. In the Foreward, Frederic writes about when he first met writer Earnest L. Williams, Jr. and his son, “by chance”, in Washing D.C. They both found that they had something in common. Frederic and Earnest both have sons who have ADHD. They bonded while sharing the challenges that they both faced having children around the same age who are suffering with ADHD. This book was illustrated by Steve Howard. The illustrations are clear, bright, and relevant. They helped me, as the reader, follow the story of Justin’s father’s journey to find answers about Justin’s behavior and ADHD. Also, I feel that the book is written in a way that can help readers relate and sympathize with anyone who many know a child with ADHD. I have a nephew who was diagnosed with ADHD, and this book helped me understand the effects that ADHD have on most children my nephew’s age. This book is a great tool to help educate kids, parents, families, friends, school counselors, mentors, and teachers about the symptoms of ADHD. It breaks ADHD down in simple and understandable terms. There is even a helpful and beneficial section of resources following Justin’s story in the book. I recommend Hey, That Kid Got Issues Maybe It’s ADHD to anyone who has a child, family member, friend, student, or mentee that has ADHD. Not only does the book help educate those who read it on the subject of ADHD, but it is a great book to read with the person that you know who may have ADHD.